Made popular today by the 2006 epic war film and the 1998 comic book series 300, Sparta was an ancient Greek city-state that went down in history as one of the world’s most powerful and warlike civilizations. And even though it is true that Sparta is known for its military prowess, what really made it great were its unique political institutions and society. Unfortunately, however, the Spartans were not fond of leaving much written information behind, and what we do know about them mostly comes from other Greeks, such as the Athenians. Some may say that what the Athenians thought about the Spartans cannot be taken at face value, given the fact that the two mighty city-states were frequently at odds with each other. And as these things often go, people usually paint their enemies in a bad light, regardless of how objective they might want to appear. Surprisingly, however, when it came to Sparta’s political institutions and society, the Athenians had mostly positive interpretations, even stating their own amazement about their efficiency. Before we can start analyzing Spartan politics and society, we must first talk about Lycurgus, the man who made it all possible. Alive sometime during the 9th or 7th century BC, Lycurgus was responsible for shaping Sparta into the militaristic society we know of today. His social and political reforms revolved around the highly-admired Spartan virtues of equality among its citizens, physical fitness, and austerity. Lycurgus’ life and deeds are mentioned in various works belonging to Herodotus, Plato, Xenophon, Plutarch, and several others. In his long travels, Lycurgus is said to have acquired a great amount of knowledge about rulership and society. After returning to Sparta, he implemented them to great effect, receiving even a sort of ‘divine approval’ from the Oracle at Delphi. He refused his laws be written down, insisting instead on the idea of peer pressure and the belief that his laws would be passed down through the deeds and traditions of the Spartans themselves. Among the many radical reforms implemented by Lycurgus was land redistribution. The lands under Sparta’s control were evenly divided and distributed among its citizens. Another way to promote equality was to institute common mess halls. All Spartan men, the kings included, were expected to have their daily meals here every day. Lycurgus is also credited for developing the famous Spartan education system for both boys and girls, as well as introducing iron coins instead of gold and silver currency. And to ensure that the Spartans would uphold these laws indefinitely, he made them all vow to keep them until his return from a trip to the Oracle – which he never did make back. What we did not mention about Lycurgus, however, is the fact that he might not have even existed in the first place. The accounts put forth by the ancient historians oftentimes contradicted each other, making it almost impossible for scholars today to say whether Lycurgus was an actual person or not. Even Plutarch, a Greek historian from the 1st century AD, makes mention of these inconsistencies, hinting at Lycurgus’ possible mythical origin. Nevertheless, some present-day historians say that a certain Lycurgus probably did exist and could have been associated with some of the reforms within Sparta, but probably not all of them, and not exactly in that form. It would be a mistake to give the Spartans sole credit for their city’s enduring legacy. The unsung heroes here are the Helots, Sparta’s lowest class. They were the original inhabitants of Laconia (the region surrounding Sparta), as well as those from Messenia, who the Spartans conquered during the 9th and 8th centuries, respectively, and who were then turned into the Helots (Spartan slaves). Unlike other Greek serfs, the Helots did not belong to individual Spartans, but were “some sort of public slaves,” belonging, instead, to the state. Their major contribution towards Sparta’s greatness came in two forms. Helot obedience and hard work ensured that every Spartan man could be free from all manual labor. But while the Helots were providing for everyone, Sparta’s men were to be soldiers by law. Sparta was, however, under constant threat from Helot rebellions. The Helots outnumbered Spartans by as many as seven to one (even though the numbers vary, depending on the source). This constant anxiety is precisely what drove Sparta to become so highly-militarized in the first place. In fact, it is generally accepted that Lycurgus, if he even existed, passed his reforms after one such Helot rebellion. One thing that becomes immediately apparent about Sparta is that it had two kings ruling at the same time. This diarchy (as opposed to monarchy), or co-rulership, is not unique to Sparta, but it is, nevertheless, rare. How Sparta ended up with a dual kingship is shrouded in mystery. Some speculate that it appeared as a sort of compromise, probably made by two or more tribal leaders sometime during Sparta’s inception, or maybe later, around 1000 to 900 BC. Each of the two kings belonged to a different dynasty, the Agiad and the Eurypontid, but claimed descendance from the same ancestor. In myth, that ancestor was Heracles (Hercules), but in a more folk-based version of events, it was King Aristodemus. The story goes that King Aristodemus had twin boys right before his death, and people could not tell which one was the eldest so as to name him king. The Oracle at Delphi instructed them to crown both brothers and regard them as their kings. This account was, most likely, an invention, but was generally accepted by Spartans. These two kings did not have absolute power, as their titles might suggest. Sparta had, in fact, a mixed constitution comprised of dual kingship, oligarchy, and democracy. This style of government was highly admired and praised by Polybius, a Greek historian from the 2nd century BC. The kings were the supreme commanders of the army. During times of war, one king led the armies, while the other remained in Sparta. The two were also the head religious figures, bringing regular sacrifices and consulting the Oracles. Lastly, they had judiciary powers, being in charge of Sparta’s roads and orphans. The democratic aspect of Sparta’s mixed constitution were the five Ephors, loosely translated to the Overseers. These posts were elected annually, most likely by drawing lots, and were open to every adult Spartan man over the age of 30. As representatives of the general public, the Ephors were overseeing everything that was going on in the mighty city-state. Their main concern was to ensure that nobody within the Spartan government exerted more power than they should, and that the laws were being upheld by everyone. They controlled the education system, police, and conducted trials concerning civil offenses. During times of war, two Ephors always accompanied the king on the campaign. They had no power of decision with the military actions taken, but would keep a constant eye out over the actions of the king. Once back in Sparta, they could even bring the king to trial for alleged errors in battle, or for acts of corruption. If the king was found guilty, he usually had to pay a fine. In more drastic cases, however, he could even risk being banished from the city. If this ever happened, the king’s eldest son would take his place. When the two monarchs disagreed on a subject, the Ephors had the deciding vote, which was chosen by a simple majority vote of 3 to 2. After their term ended, the five Overseers were put in front of their successors, in order to account for any abusive actions while in office. Years in Sparta were named after the lead Ephor of that respective year. One other duty that was part of the Overseers’ activities was to officially re-declare war on the Helot population. They did this every year, as part of their inauguration, by making use of one of Sparta’s most mysterious and controversial institutions, the Krypteia. Scholars today are still debating the actual nature of this organization. Some say that it was an early form of secret police, while others believe it to be more of a military unit specializing in guerrilla tactics and other covert operations. Whatever its true purpose was, the Krypteia’s activities consisted mainly in staking out and harassing the Helot settlements surrounding Sparta. Young soldiers in their late teens who showed promise during their military training were enrolled in the Krypteia. They were armed with knives and set loose on the surrounding countryside. During the day, they would hide from sight, but would look out for potentially dangerous Helots or any signs of unrest. At night, they would descend into the villages and kill every Helot they encountered wandering the streets. While there is no denying that this gruesome practice happened on a daily basis, scholars cannot agree on what was the main purpose behind it. Some believe that this was just a continuation of the Spartan training regime, as a means to ‘blood’ the young soldiers and prepare them for the harsh conditions of war. Others, on the other hand, believe that the Krypteia was there as a means of terrorizing the Helots into submission. Whatever the case, the simple existence of this institution and its gruesome practices are evidence enough to prove the Spartans’ fear towards their slaves. The Gerousia represents the oligarchic element in Sparta’s mixed constitution. Also known as the Council of Elders, the Gerousia was comprised of 28 men over the age of 60, as well as the two kings. These men were elected for life and were, most likely, part of aristocratic families. In the early days of the institution, which can also trace its origins back to Lycurgus’ reforms, the members were elected based on merit. But things degenerated over time, however. According to Aristotle, the election process was “absolutely puerile.” A small group of judges would stand in a room nearby, where they could not see, but could hear everything. 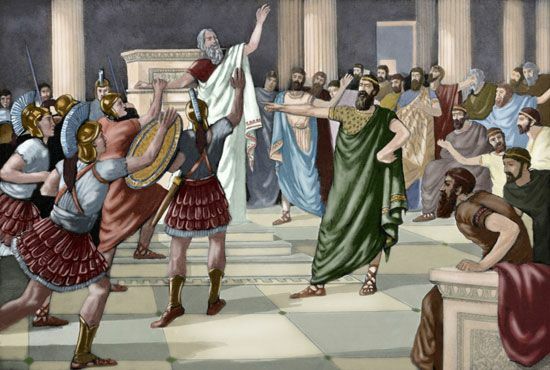 Then, each candidate would parade in front of the general assembly, greeted by the shouts of all the Spartans present. The candidate with the most vocal support – as heard by the judges – was to be the newly elected member. Nevertheless, the post did come with its own set of privileges. In fact, Plutarch remarked on the conclusions of a visitor to Sparta who said that “only in Sparta does it pay to grow old,” referring to the Gerontes (members of the Gerousia). For starters, these men could not be held accountable for their actions. They exercised their judicial powers over cases of the utmost importance, such as murder, and could impose sentences like death, banishment, or disenfranchisement. If a king was under investigation for a potential crime, the Gerousia, the Ephors, and the other king would all stand in judgment. The Gerousia also prepared the agenda for the monthly assembly meeting. During these gatherings, all Spartan men were present. The Assembly was presented with a new proposal, after which they had to vote without further debate or deliberation. The Gerousia had the power to veto the decision of the General Assembly, however. This gave the Spartan constitution a high degree of conservatism and a low chance for any radical law to take effect. While ancient scholars praised this aspect, seeing it as a moderating factor, present-day academics view it as a non-democratic element. Nevertheless, the Gerousia is believed by some to be among one of the earliest examples of counting votes, if not its origin. It would be somewhat of a mistake to think that Sparta relied solely on its well-trained army to become a dominant force in Greece. Diplomacy played an equally-important role; granted, it was being enforced by Sparta’s own military might. In fact, Sparta was the first nation in the world to create a permanent alliance system, somewhat similar to present-day NATO. Known today as the Peloponnesian League, this military coalition’s official name was ‘the Lakedaimonians (Spartans) and their allies.’ How and why this league was created, in the first place, is unknown. Nevertheless, it managed to rally almost all Peloponnesian city-states, with the exception of Argos. 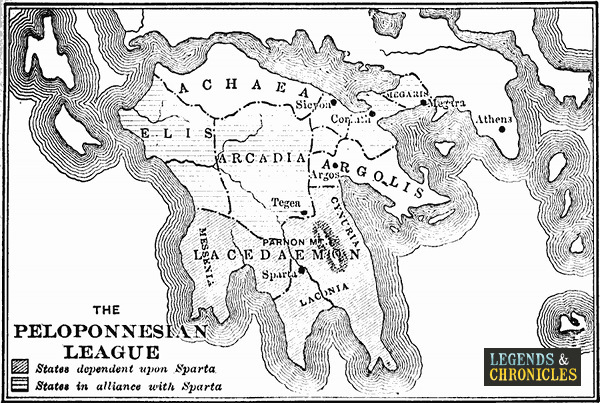 Sparta’s rivalry with Argos may have been the primary reason for the creation of the league to begin with. The other, less powerful city-states in the region may have also joined as a means of protecting themselves from the threat Argos posed to their independence. Unlike other such ancient alliances, the Peloponnesian League did not demand financial tribute from its members, and only required a promise of mutual military assistance against outside enemies. Each individual city-state joined by negotiating their own terms. But while more powerful cities, like Corinth, may have gotten a better deal, less powerful ones were, most likely, subject to Spartan pressure and political interference. Under Spartan command and coordination, the league managed to defeat the city of Argos, and then conquered Athens in 404 BC. In short, the league ensured that Sparta went from a local power to a super-power by defeating the Athenians and inheriting their maritime might over the Aegean Sea. In the eyes of its members, the Peloponnesian League offered Spartan protection, while at the same time it represented a means to maintain their freedom. This was in opposition to the Delian League started by Athens, where power was much more centralized, more closely resembling an empire than an actual alliance. After 382 BC, the Spartans also began demanding tribute from their confederates, and after being defeated by the Thebans on two separate occasions, very few Greeks were willing to save the league from its inevitable decline. Only several years later, in 366 BC, the Peloponnesian League had dissolved. In the aftermath of the Peloponnesian War (431–404 BC), Athens was at the mercy of the Spartans. Deciding against razing the city to the ground and sending the entire population into slavery, as was suggested by the Corinthians, Sparta opted instead to shape the city into a mirror image of itself. 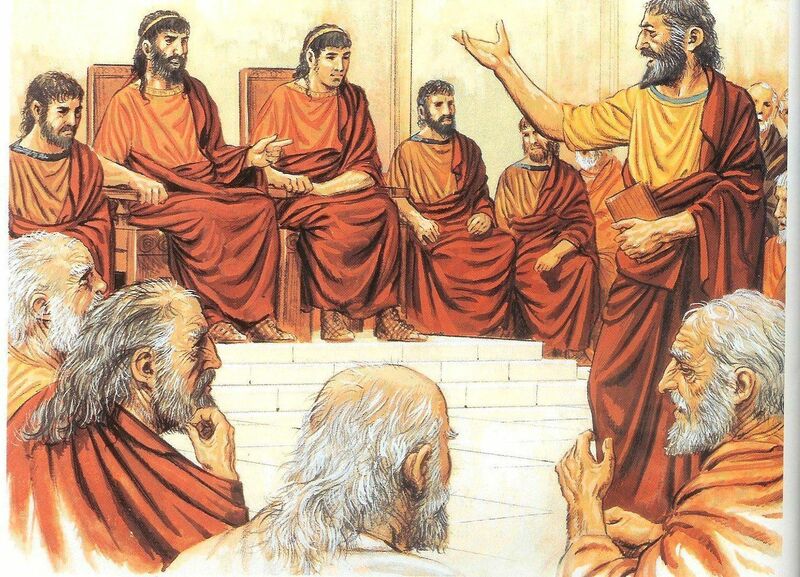 The new governing body was to be comprised of 30 Athenian aristocrats who always despised democracy and were in favor of oligarchy. These men were to be infamously known as the Thirty Tyrants. They revoked most citizens’ voting rights and kept only 3,000 pro-oligarchy Athenians, known as ‘the Included.’ These 3,000 men were the only ones allowed to live in the city-proper, while the rest had to move elsewhere around Athens. The Thirty reformed most laws, so as to consolidate their rule, and began eliminating the opposition through exile, murder, and confiscation of property. The Thirty also employed 300 lash-bearers to patrol the streets and act as a sort of martial-law police. A total of 1,500 Athenians died under their tyrannical reign. Not one year later, however, their rule was overthrown by a group of democratic exiles who returned to the city. Sparta, not wanting to get involved in the conflict because of its own internal issues, sent only a garrison to Athens. Nevertheless, the revolt prevailed and Sparta mediated a peace treaty, after which it left the region. As this was mostly an Athenian affair, a general amnesty was proclaimed so as to maintain what little unity and stability remained in the city. This amnesty, the first of its kind in Western history, meant that all later charges and re-incriminations surrounding the incident were forbidden by law. The Thirty, as well as other pro-oligarchy Athenians, died during the attack. Socrates was later executed for treason, partially because he was close friends with Critias, the leader of the Thirty, along with his refusal to go into exile during their rule. Spartan women enjoyed a degree of freedom and equality unmatched anywhere in the classical world. They received the same amount of education as Spartan men, and even though it differed, it was far more than any other Greek woman received. They were entitled to property, and when it came to divorce, the same rules applied for both sexes. Spartan women usually married at around the age of 20, and were able to negotiate with their husbands about bringing lovers into their homes. Likewise, a man could also approach another and ask his permission to be with his wife, so as to produce heirs. These actions were not only allowed, but actually encouraged by Spartan society, as a means of producing more babies and to disregard such feelings as jealousy. When it came to daily life, women in Sparta would walk about freely and engage in conversation with men. This was unheard-of in other Greek cities, such as Athens, where women would rarely be seen outdoors. Spartan women wore short dresses and oftentimes engaged in physical and gymnastics training – oftentimes being completely naked. During religious festivals, both men and women gathered in public areas, wearing nothing at all. Greek women rarely made it into the history books, mostly because those books were written down by Athenian men. Nevertheless, Queen Gorgo, wife of King Leonidas I of Sparta, did make it, being mentioned by Herodotus in his Histories. She was particularly acclaimed for her wisdom, wit, and her ability to exercise authority around her. If anything, her simple mention in history is enough to denote the greater degree of freedom and equality these women enjoyed, as opposed to their other Greek counterparts. When it came to inheritance, Spartan women would receive half of what her brother would. If one woman had no brothers, she would receive the entire inheritance. These women were known in Sparta as patrouchos which loosely translates to ‘holder of the patrimony.’ While the accumulation of wealth and other material goods were not part of the greater Spartan ethos, land ownership was highly sought after. Because of the numerous wars, Sparta suffered from oliganthropia, or a scarcity of males. Over time, and with the inheritance laws in their favor, Spartan women ended up owning over a third of all property and land in Sparta. By the mid-3rd century BC, some of these wealthy women became patrons to many Spartan men. Two royal widows come to mind here, Agesistrata and Archidamia, the mother and grandmother of King Agis IV. They were said to be the richest people in the whole of Sparta. Because of their wealth, these women were able to gather much support behind them and even influence political matters. It is also true that by this time in Sparta’s history, there was a huge socio-economic disparity between people. It is not certain whether this discrepancy appeared as a result of the these rich women’s influence over policy-making, but what is certain is that it certainly aided in the further consolidation of their wealth and influence.